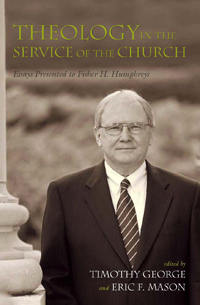 This volume celebrates the life and work of Fisher H. Humphreys, a noted Baptist theologian whose teachings and writings have shaped several generations of pastors, missionaries, and theological students. Humphreys has said about his own life’s work: “My theology is church theology. I do thinking about God in the fellowship of the church.” Since 1990, Humphreys has taught systematic theology at Beeson Divinity School of Samford University following an even longer tenure on the faculty of New Orleans Baptist Theological Seminary. Written by Humphreys’s colleagues and friends, the essays here illuminate various aspects of the theologian’s calling from the standpoint of specific theological disciplines and from the intersection of theology with other areas of Christian life and thought. In this way, Fisher Humphreys’s self-understanding of his own vocation as a theologian of the church is commended and the importance of thinking clearly and faithfully about God in the fellowship of the church is seen to be a vital component in the life of the faith.